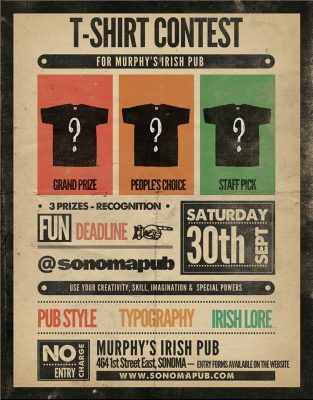 Murphy’s is sponsoring a t-shirt contest through the end of August. We are looking for the next greatest t-shirt that hundreds of Murphy’s Irish Pub fans will wear across the world. People’s Choice: This will be voted on Facebook for one week. Top ten entries will be entered into the last Voting round ending the first week of September. Winner will receive $100.00 plus dinner for 4 guests (value not to exceed $200). Staff Pick: We will let the Staff Vote for their top pick. Winner will receive $100.00 plus dinner for 4 guests (value not to exceed $200). Must be able to be affordably printed by a commercial t-shirt printer. PG Versions only – no offensive material or curse words. T-shirt can be one or two sided or a side and a sleeve but no more than 2 positions.